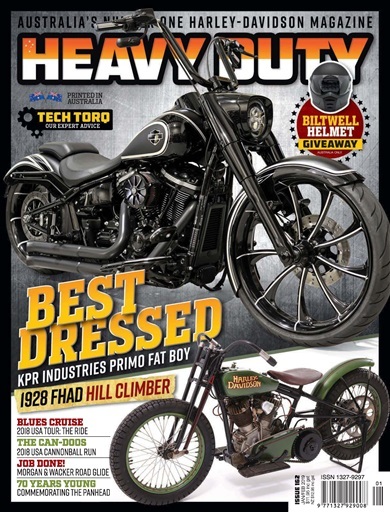 Welcome everyone to a new year and a new issue of HEAVY DUTY. Our first cover bike for 2019 is a very tasteful and very smooth 2018 Fat Boy, subtly enhanced by KPR Industries to be a stylish and cool reflection of the new generation Softail. This is how owners of these bikes want their rides to look – contemporary, low and clean. And the KPR bike has nailed that look. As well, we have a magnificent 1928 Harley-Davidson FHAD Hillclimber race bike. From the Harley City collection, this bike is a superb example of a high performance H-D from the early 20th century. Plus there is a huge Tech Torq feature and Dave Cohen rides a big-bling Brisbane Road Glide. 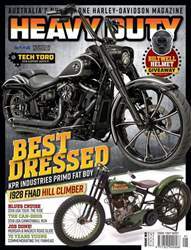 We feature the 2019 USA Cannonball Run, the official opening of Harley Heaven in Sydney, Extreme Horsepower Expo, Bendigo's Shovelfest weekend, the 2019 HEAVY DUTY ‘Blues Cruise’ USA tour and much more. It’s all here for your holiday reading enjoyment so Happy New Year to all our readers!